San Francisco, CA. 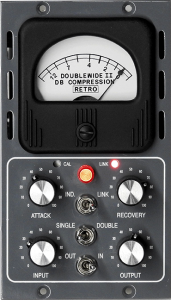 November 8, 2018 – Retro Instruments, Inc. has just released the DOUBLEWIDE II, the long-awaited update to the original 500-Series DOUBLEWIDE tube compressor. 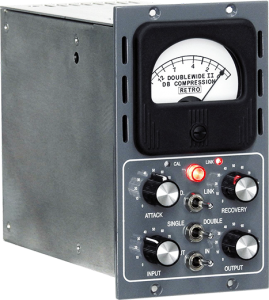 The DOUBLEWIDE II is a single-channel compressor that installs into two slots of a standard 500 series rack yet it requires only 130-milliamps of current—just like the original Retro DOUBLEWIDE compressor. Also retained from the original are the gray painted front panel, high-quality US-made Simpson gain- reduction meter, and hand wiring throughout (no troublesome ribbon cables). DOUBLEWIDE II’s excellent build-quality is apparent starting with the American-made PC board and extends to the durable and attractive stainless steel case and, don’t forget, we only use Cinemag’s highest-quality input and output transformers for authentic tone and weight plus the complete freedom from external interference and noise. During initial user testing and comparison, the DOUBLEWIDE II immediately exceeded all expectations with increased flexibility and control that many original DOUBLEWIDE users have demanded. With both faster attack and release (recovery) times now possible, the DOUBLEWIDE II excels at energizing vocal tracks as well as controlling bass, guitars and drum tracks in an elegant and transparent way or go extreme and radical—or dial in anywhere in between! Our beta testers/recording engineers found the new DOUBLEWIDE II nearly magical for processing all percussive sounds easily; it’s capable of tight, sonic consistency all the way to explosive, full-bodied impact on snares, kicks and tom-toms. 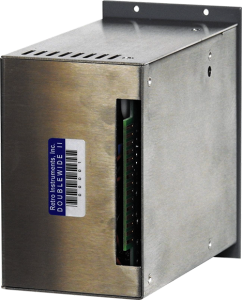 With the addition of the new stereo linking feature (in a 500 racks that support linking), two DOUBLEWIDE IIs are just amazing for drum overheads, pianos, stereo pads, backing vocals; the list grows daily with new uses coming in from our customers. We hope you join this list of happy and satisfied Retro Instruments customers who depend on the awesome sound and processing power of the new DOUBLEWIDE II 500-Series Tube Compressor!